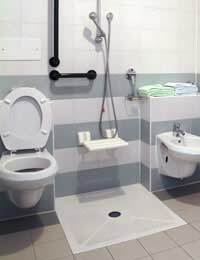 Disabled Facilities Grants are available from local councils to help pay for necessary adaptations to your home.Formed by the government, this grant enables disabled people to adapt their home so that they can continue to live there. You can apply for a Disabled Facilities grant if yourself, or someone else living in your home, is disabled, one of you either owns or is a tenant of, the property and you can certify that you, or the person who you are applying for, will occupy the property for five years. If you are a landlord and have a disabled tenant, you can also apply for the grant to adapt the property for their use. These grants are provided by your local council and can be used to adapt your property in order to give the disabled resident freedom of movement in and around the home.This could include work such as the widening of doors, installing ramps, installing a stair lift or providing a downstairs bathroom.There is also the option to use the grant to improve facilities in the home, such as the heating system or lighting controls. The first step in the process is to request that an occupational therapist come out and assess your home. This will provide you with a better idea of what adaptations you will require.Then you can start the application process. Firstly, you need to contact your local council – specifically the housing or environmental health department. It is important to bear in mind that your application won’t be accepted if you have already started carrying out the work on your property, but the council are under obligation to notify you of the outcome of your application within six months. Like many other grants offered by local councils, the Disabled Facilities Grant is means-tested – based on an assessment of your financial situation.Basically, the council will look at your weekly income and essential outgoings, such as rent or mortgage payments and personal expenditure, to determine what level of the grant you will need. They also take into account your savings, which if above a certain level can have an impact on the amount you will receive. However, if you are applying because you have a disabled child under the age of 19, then there is no need for means-testing and you will receive the full amount.If you are married, or have a partner, the council will assess your combined income, but the first £6,000 of any savings you might have is ignored. The maximum grant amount available is £25,000 for applications in England and Northern Ireland and £30,000 in Wales. With any building work, especially if external changes are being made, planning permission or buildings regulation approval may be required. This is not included in the application for the grant and you will have to apply separately to gain any approval you might need before you start the work. Once you have received the grant, the council can also request that you employ a qualified individual, such as an architect or a surveyor, to make sure that the work is carried out appropriately, but you can use a portion of the grant to pay for this. If you have been refused a Disability Facilities Grant by your local council don’t panic just yet, you can appeal. Each local council has an appeals and complaints procedure.If this isn’t effective, you do have the option of registering a complaint with the Local Government Ombudsman. Hi I have a special needs wee sister..and my mother just past away just 3 months ago my wee brother moved into the house where my mum and sis lived.. I have 4 children and live in a 3 bedroom bungalow and she always wants to come stay with me.. Would it be possible to get a grant to build her a bedroom onto my bungalow? The lady with the insecure garden may get some help from The Family Fund.She would not get £10,000 though.Maybe they could make a small area safe. Hi,a year ago we moved to a one bedroom housing executivebungalow due to an immediate need to move to a place without stairs. My wife was having serious problems due to disabilities. Due to this bungalow having one bedroom my wife, my son and I share. My son is 11Years old now and we thought that we might qualify for an extension(extra bedroom) but when we had an assessment by an occupational therapist they said it wasn't disability need but a social need.And the housing executive are not helping with an extra room either. My wife is very happy in our new home and wants to stay as she feels safe and happy. But we Need an extra room. What can we do. Hello My father is registered blind and lebers diagnosis (neurological) stiffness in his body so he cannot move around without excruciating pain. He is 70yrs old. His kitchen is in urgent need of renovation .The roof is falling down and so are the units. He cannot access the units as they are either too high or too low. He cannot use an air in the kitchen as it’s too tight for him to go inside and use the kitchen independently. We asked for assistance from local council as the OT had only suggested a lift in the property. As for his eye sight... there’s no help available. I am registered blind since March I wanted to know if i an entitled to a grant for extended bath roomdown stairs please.As the current bath room is to small and I can’t adopt to my current bath room is a hazard please. Hi my son has ADHD learning issues and is deaf he wants to have a play room so he can be close to the garden ,I did ask the council if they could put patio doors in they said no so am to scared to ask if they can build a small extension fory son ? Hi I wanted to know if I can get help towards maintain my garden as fences are broken my daughter has gotadhd . It’s hard for me to afford much to maintain my garden as it can take up to 10000 pounds to maintain it .It’s not secure for her to be alonetobring friends over as I don’t let her go out aloneif Ican get a grant so she can bring her friends home so I can keep an eye on herso it’s better for her. My wife is registered disabled, I have health issues osteoarthritis, compressed discs in the spine and prostate problems and I am in constant pain I am not registered disabled. My doctor is supporting the requirement to have a bath fitted instead of the current walk in shower. It will be difficult for my wife to use a bath because of disability and we are now looking into a low level bath with a bath lift. An occupational therapist is going to assess my wife to see if this adaption is feasible.If my wife gets the go ahead from the OT would the work come under a grant? Hi - my mum is in her 90th year and lives independently in sheltered housing; she is getting frail and she needs now to move in with me as I am her only care giver.I work from home in my converted garage and am looking to convert my office into a granny annex for her, which means putting in a small kitchen and shower room.She is a registered disabled person; I live in the Wokingham area of Berkshire - do you think I can get a grant to have my property converted?Thanks for reading this post. Hi I wanted to make a attic I need to take permission from council and I want it to convert it to a big room my daughter is diagnosed with adhd she needs her own bedroom as my house is 3 bedroom I have 3 boys 1 girl me my husband I wanted to know if I will be able to gets grant from council. If your daughter is registered with a disabilty you may be eligible for a disabled facilities grant, you should contact your local council. Hi I wanted to make a attic I need to take permission from council and I want it to convert it to a big room my daughter is diagnosed with adhdshe needs her own bedroom asmy house is 3 bedroom I have 3 boys 1 girl me my husband I wanted to know if I will be able to gets grantfrom council . my local council won't fund for an extension we would need about £40.000 and they said that they would rather provide him with a flat but he would still need someone to look after him and we probably wouldnt be close at hand.I am literally tearing my hair out! My son is a wheel chair user with cerebral palsy.He is now 26 years old and I have always cared for him but due to the fact that we only have an ordinary kitchen I cant teach him any life skills in the way of cooking etc,We also havn't got a downstairs loo and he has to get up and down the stairs on his bottom.He actually hasnt been in thr garden since he got too big to carry.Is there any way of getting a grant to build an extension so we can have a loo and a low level kitchen that he can use? You should be entitled to a disabled facilities grant. Talk to your local council. Coco, Have you tried your local council for a disabled facilities grant. (Warning mine took over 2 years and made a hell of a mess) you need an OT assessment first. Talk to your local authority. In some cases, the grant does has to be repaid if the property is sold etc.